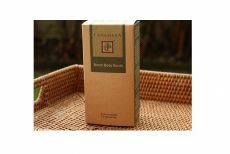 A combination of herbs with warming properties whose main function is to have a warming effect on the skin and muscles to energize and rejuvenate a tired mother’s body. Mix 1 sachet with 3 tablespoons hot/warm water until you get a thick paste. Apply paste all over your body. Wait the paste to half dry (still moist) and scrub skin with your hand in a gentle circular motion. Rinse off excess scrub and shower as normal.